Dr Teena has over a decade of experience within the dental industry, having worked since 2007 as a dentist in Australia. She began her dental studies in India, her country of birth, before making her way to Australia in 2003 to complete her dental exams. From childhood, Dr Teena was encouraged by her father to pursue a career in dentistry due to the field being held in high-regard, particularly in India. Dr Teena’s desire to help others and her admiration for the health industry also led her to pursue this path, and as soon as she began to study dentistry, her passion for the field began to soar even higher. 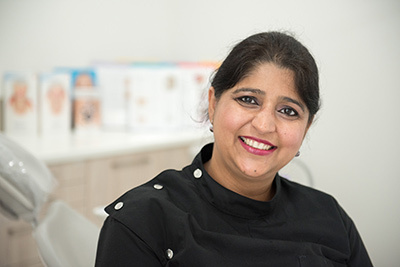 Although Dr Teena has in-depth experience and training in many types of dental treatments, she is particularly passionate about providing gentle and friendly dental care to children. As a mother of two herself, Dr Teena possesses a greater understanding of a child’s needs, along with the ability to put her younger patients at ease by making their dental experience fun, rather than stressful. Along with children’s dentistry, Dr Teena is also passionate about helping older patients to maintain excellent oral health and comfort. She frequently creates and fits dentures and enjoys the long-term, friendly relationship she has with her patients. Dr Teena’s believes in helping both young and old, she also provides trusted and affordable dental services to patients of all ages. She has always enjoyed oral surgery (particularly extractions), along with the sense of accomplishment that comes with helping a patient overcome their dental concerns. Dr Teena continues her professional development through regular courses, helping her to stay on-top of the latest technologies and procedures so she can provide her patients with unparalleled dental care. Dr Simon Briggs services dental practices throughout NSW providing high quality consistent treatment for patients. Dr Simon Briggs began his mobile practice in 2000 on returning from 2 years studying and working in the UK. After graduating with his BDS(syd) in 1997, Dr Briggs worked in the Maxillo Facial department of three prominent hospitals in London and Wales. He returned to Sydney with his Fellowship from the Royal College of Surgeons (FDS RCS) London, and began teaching and working at Westmead Hospital, Sydney. Dr Briggs obtained his Diploma of Clinical Dentistry in Intravenous Sedation and Pain Control in 2000 and he began servicing several practices in the Sydney area with dental surgery, IV Sedation, dental implant procedures and bone regenerative procedures. Dr Briggs has completed multiple courses internationally and domestically in bone grafting, oral implantology, Advanced Life Support and Intravenous Sedation. He is a member of Australian Dental Association (ADA). Today, Dr Briggs has become a mentor in implant techniques for a number of colleagues and practices, placing well over 350 implants per year. As well, Dr Briggs is highly trained in Dento-Facial Aesthetics and provides patients with various options of treatments including relaxant injections, Dermal Fillers and aesthetic therapies. He is a member of the Australasian Academy of Dento-Facial Aesthethics. His other professional memberships include the Australian Dental Association, Australian Society of Implant Dentistry, Australian Society of Dental Anaesthesiology and the International College of Oral Implantology. In his spare time, Dr Briggs enjoys spending time with his wife and four children, collecting wine and playing soccer and tennis.